The Niagara Region is responsible for the operation of water and sewer systems in Niagara. The municipalities' buy the treated water from the Region and resell it to residents. The Region sells water to the municipalities at a rate of 25 per cent for fixed cost and 75 per cent based on projected usage. The Region acts like a wholesaler who sells a product (water) to the retailer- your municipality. Residents in Niagara do not receive a bill directly from the Region for their water. Municipalities purchase the water at a wholesale rate from the Region and then resell it to its residents. 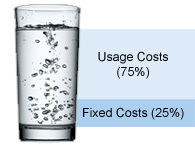 Billing is handled by your local area municipality and includes fees that cover costs related to local water delivery. Residents receive a bill which pays for the fixed costs associated with water and wastewater as well as usage fees (consumption). Your bill is paid directly to your municipality.